Mr. Paston is called in about his pretensions to the part of the ground on which the Scotch Secretary's Office is built. He says the Earl of Yarmouth has a grant of part of that ground. He is desired to bring the patent to my Lords that it may be examined and he promises so to do. The bidding for the farm of the lotteries is to be adjourned to this day fortnight. Mr. Bertie and Mr. Neal's hearing is to be put off to this day week. 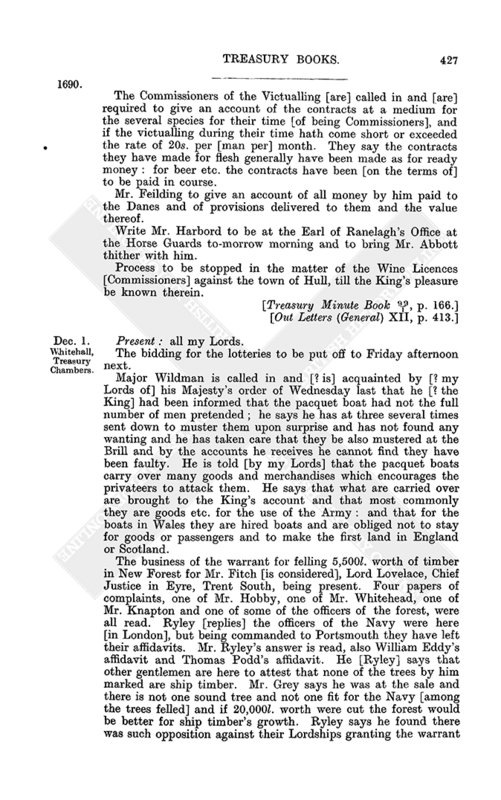 Mr. Thompson's petition for derelict lands is read ; and Mr. William Ravenhill [appearing] for Sir Tho. Chichley is heard ; and he suggesting that the former inquisition granted to Sir Tho. Chichley could not be executed for want of a quorum and that he will execute this new Commission by the 28th inst. and bring it to this Board before it be filed, order is given that Sir Tho. 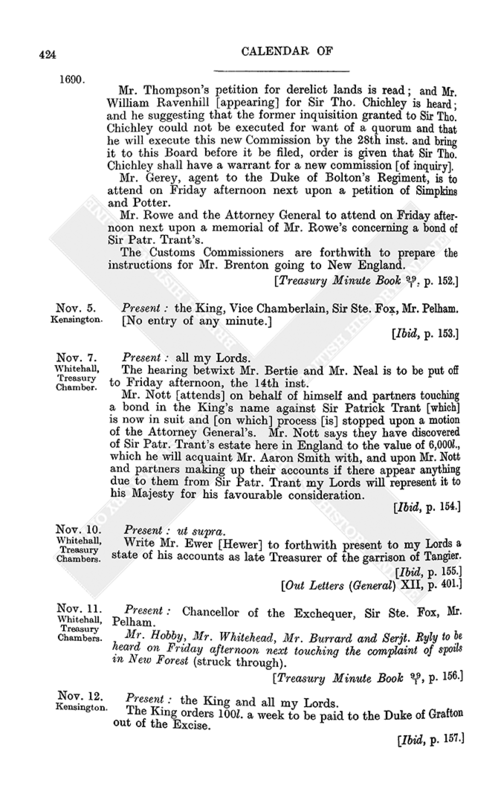 Chichley shall have a warrant for a new commission [of inquiry]. 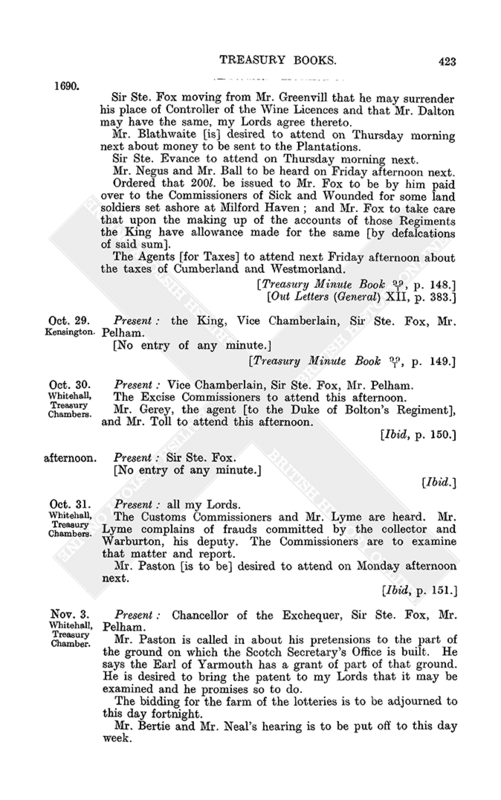 Mr. Gerey, agent to the Duke of Bolton's Regiment, is to attend on Friday afternoon next upon a petition of Simpkins and Potter. Mr. Rowe and the Attorney General to attend on Friday afternoon next upon a memorial of Mr. Rowe's concerning a bond of Sir Patr. Trant's. The Customs Commissioners are forthwith to prepare the instructions for Mr. Brenton going to New England. Present : the King, Vice Chamberlain, Sir Ste. Fox, Mr. Pelham. The hearing betwixt Mr. Bertie and Mr. Neal is to be put off to Friday afternoon, the 14th inst. Mr. Nott [attends] on behalf of himself and partners touching a bond in the King's name against Sir Patrick Trant [which] is now in suit and [on which] process [is] stopped upon a motion of the Attorney General's. Mr. Nott says they have discovered of Sir Patr. Trant's estate here in England to the value of 6,000l., which he will acquaint Mr. Aaron Smith with, and upon Mr. Nott and partners making up their accounts if there appear anything due to them from Sir Patr. Trant my Lords will represent it to his Majesty for his favourable consideration. Write Mr. Ewer [Hewer] to forthwith present to my Lords a state of his accounts as late Treasurer of the garrison of Tangier. Mr. Hobby, Mr. Whitehead, Mr. Burrard and Serjt. Ryly to be heard on Friday afternoon next touching the complaint of spoils in New Forest (struck through). The King orders 100l. 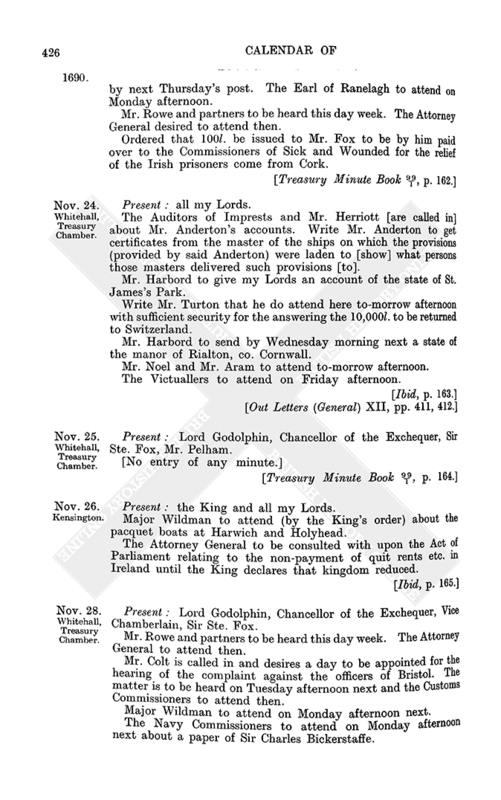 a week to be paid to the Duke of Grafton out of the Excise. Mr. Ryly desires to be heard upon the complaint made of spoils committed in New Forest. The day appointed is Monday week and Hobby, Whitehead and Burrard to have notice ; and Ryly giving a note of the witnesses' names is to have summonses for them. The new [Treasury] Commission [is] opened. The bidding for the lotteries is to be put off to this day fortnight. The hearing about the spoils in New Forest is to be put off to this day fortnight. The Auditors of the Imprest and Mr. Hewer concerning his accounts are to attend this day week. The inhabitants of East Stockwith are to be heard on next Friday week. Move his Majesty touching the money due for transports. Present : Vice Chamberlain, Chancellor of the Exchequer, Sir Ste. Fox. Mr. Stephens is called in and says the Navy has occasion for 50,000l. this week. Ordered to be issued accordingly. Sir Jos. Herne and Sir Ste. Evance [are called in] about returning [providing bills of exchange for] 10,000l. for Switzerland. They propose to pay 40,500 crowns there [in return] for 10,000l. [to be paid them in cash] here ; or they will take 1 per cent and give account of the exchange ; but they will not run the risk of the bills. Mr. Turton is called in about the same business and [is] told [of] Sir Joseph Herne's proposal of 40,500 crowns and he offers to do it at the same rate on both their proposals. My Lords will speak with the Earl of Ranelagh and come to a resolution by next Thursday's post. The Earl of Ranelagh to attend on Monday afternoon. Mr. Rowe and partners to be heard this day week. The Attorney General desired to attend then. Ordered that 100l. be issued to Mr. Fox to be by him paid over to the Commissioners of Sick and Wounded for the relief of the Irish prisoners come from Cork. The Auditors of Imprests and Mr. Herriott [are called in] about Mr. Anderton's accounts. Write Mr. Anderton to get certificates from the master of the ships on which the provisions (provided by said Anderton) were laden to [show] what persons those masters delivered such provisions [to]. Mr. Harbord to give my Lords an account of the state of St. James's Park. Write Mr. Turton that he do attend here to-morrow afternoon with sufficient security for the answering the 10,000l. to be returned to Switzerland. Mr. Harbord to send by Wednesday morning next a state of the manor of Rialton, co. Cornwall. Mr. Noel and Mr. Aram to attend to-morrow afternoon. The Victuallers to attend on Friday afternoon. Major Wildman to attend (by the King's order) about the pacquet boats at Harwich and Holyhead. The Attorney General to be consulted with upon the Act of Parliament relating to the non-payment of quit rents etc. in Ireland until the King declares that kingdom reduced. Mr. Rowe and partners to be heard this day week. The Attorney General to attend then. Mr. Colt is called in and desires a day to be appointed for the hearing of the complaint against the officers of Bristol. The matter is to be heard on Tuesday afternoon next and the Customs Commissioners to attend then. Major Wildman to attend on Monday afternoon next. 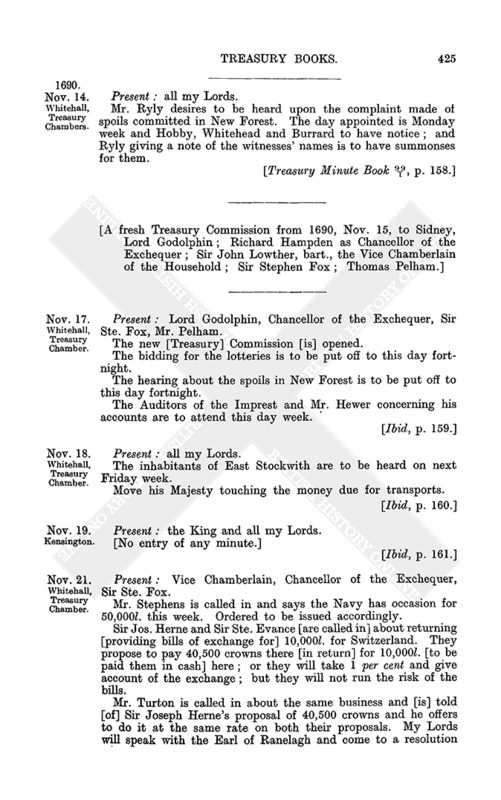 The Navy Commissioners to attend on Monday afternoon next about a paper of Sir Charles Bickerstaffe. The Commissioners of the Victualling [are] called in and [are] required to give an account of the contracts at a medium for the several species for their time [of being Commissioners], and if the victualling during their time hath come short or exceeded the rate of 20s. per [man per] month. They say the contracts they have made for flesh generally have been made as for ready money : for beer etc. the contracts have been [on the terms of] to be paid in course. Mr. Feilding to give an account of all money by him paid to the Danes and of provisions delivered to them and the value thereof. Write Mr. Harbord to be at the Earl of Ranelagh's Office at the Horse Guards to-morrow morning and to bring Mr. Abbott thither with him. Process to be stopped in the matter of the Wine Licences [Commissioners] against the town of Hull, till the King's pleasure be known therein.